-- 2013, 2017 Gold Cup champion with the USA. But he will always be associated with one loss. Gonzalez's own goal in the 17th minute put the USA behind in the final World Cup 2018 qualifier at Trinidad & Tobago, and it never recovered. The own goal was a fluke. Aren't they all? But Gonzalez could wack the ball 100 more times like he did to try to clear Alvin Jones’ cross and never would it loop over the outstretched right arm of Tim Howard like it did on Oct. 10, 2017. The own goal has come to symbolize the biggest defeat in the history of U.S. men's soccer, the 2-1 loss to lowly Trinidad & Tobago that knocked it out of the 2018 World Cup, ending a streak of seven straight appearances in the finals. Afterwards, Gonzalez was inconsolable, but he was one of the few American players who faced the media and he apologized for the own goal. "I think for myself, it's one that will haunt me forever," he said. "Don't even know how to put it into words what I'm feeling. What was supposed to be a celebration is now ... I don't even know what to say. It's terrible." The USA's elimination still depended on two other results -- Panama and Honduras both coming from behind to beat Costa Rica and Mexico, respectively -- and Gonzalez said he knew right away when he looked over at the bench and the faces of his teammates that it was not good. "Just want to say sorry to the fans -- all the U.S. fans that were pulling for us, that wanted to go to Russia and that believed in us," he added. "We let down an entire nation today." Gonzalez was then off to suffer in silence and get on with his career, a career that has since seen him change Mexican clubs, moving from Pachuca to Atlas in 2018, and return to the national team for the first time since Couva with his recall for the friendlies against Ecuador and Chile. "It's definitely lingered," he said on Tuesday at a media roundtable at the USA's hotel. "It stayed with me for a long time. I don't think I'll ever be over it, but I am past it emotionally. As an athlete, you can't stay with those things too long or else you lose what you're doing at the moment, right? I still have teammates on the field that rely on me to do my job at my club." Gonzalez says now he was in shock after the loss and in a bad place, and one of the hardest parts was that he had to suffer alone. Some of his teammates -- Michael Bradley and Jozy Altidore, notably -- were jeered mercilessly but at least they had each other. "I wasn't able to talk to anybody who was there with me," he said, "because after the loss you all go your separate ways." LA Galaxy, MLS Cup 2009: Back row (L-R): David Beckham, Omar Gonzalez, Gregg Berhalter, Todd Dunivant, Jovan Kirovski, Donovan Ricketts; Front row: Sean Franklin, Landon Donovan, Chris Birchall, Mike Magee, Edson Buddle. But Gonzalez knew he had to get on with his career and he turned to someone whom he had turned to before and who had been at his side -- literally -- when he started out as a pro with the Galaxy: Gregg Berhalter. Berhalter had come back from Europe, where he spent the first 16 years of his playing career, and finished up with the Galaxy, starting with Gonzalez as the two center backs on the 2009 team that won the MLS Supporters' Shield but fell to Real Salt Lake in a shootout in MLS Cup. In 2011, his last year with the Galaxy, Berhalter became a player-assistant coach, a job Gonzalez said he did with enthusiasm, showing up 40 minutes before practice to line the field with cones and designing passing drills. By then, Berhalter had become a mentor to Gonzalez. "From that point on, he was always hard on me and trying to get me to improve and teaching me things," Gonzalez said. "We built this relationship and I sought out his input because I valued how he sees the game. Any time I had to make a big decision or things like that, I would always reach out to him." Right after Couva, Gonzalez contacted Berhalter, who was then the coach of the Columbus Crew, and he asked for his former teammate's help to find a tactical analyst who could work on his game. "I started paying this guy," he said, "and understanding the game better, understanding my position with the ball, without the ball, things like that." A year and a half later, Gonzalez says he is a different player. "I really put in the work to improving where people might think I had many faults," he said. "I really took a look at myself and said, 'Where can I improve on my game? And the things I do well, can I do them even better? And also improve the things I don't do so well.' Over this time period, I really improved on the ball and in many areas. It's been hard work, but that's the great part of doing what you love and trying to master your craft. It's daily grind of putting in the work." Gonzalez is 29 with no guarantee of being around the national team through the end of the new cycle so he says he's mindful of staying in the present and just relishes the chance to play for Berhalter. "I've always told him that I would love to play for him," he said. Photos: Robin Alam/Icon Sportswire, Andy Mead/YCJ/Icon Sportswire. 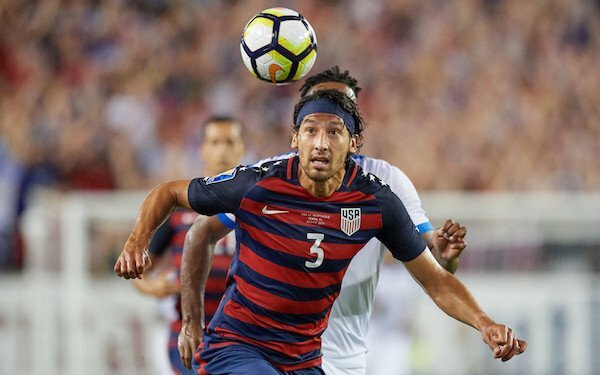 7 comments about "Omar Gonzalez heals after Couva loss and gets second chance thanks to his mentor, Gregg Berhalter". Frans Vischer, March 20, 2019 at 11:43 a.m. It wasn't just his own goal. Gonzalez was lackadaisical the entire match against T&T. He jogged to his corner, allowing a T&T forward to easily beat him to the ball and cross it, resulting in the other T&T goal. Shameful! I'm very disapointed he's back wearing the US crest. Chad Moon, March 20, 2019 at 12:35 p.m.
Let's also not forget that he had that bad tackle that should have been a penalty in the 1st half of that game too. He was shockingly bad. There are very few players from that game that deserve to wear the national team jersey again. Jay Ramirez replied, March 20, 2019 at 12:45 p.m. I agree with the other two comments. Couva was the prime example of how terrible a player he was during qualifying but it was not an isolated incident. He was signle-handedly responsible for multiple goals against the US during the qualifying campaign. I honestly believe that if he were not part of the national team during the qualifying campaign we would have gotten through. Some people just don't want to wear the jersey bad enough. This is one of them! When a new coach comes in everyone gets a clean sheet. This call-up shows that Berhalter is walking the walk. I hope that this is just a call-up based on club play and turns into nothing more. Gonzalez is a guy that may show well in training but he is a guy that you can't depend on when you need him. Bruce Arena learned that when he stuck with him because he is an "Arena" guy which is an attribute that Bruce has shown with other players as well (Agoos). Omar's laziness on the field in big games should be put in a video to show kids how not to play when the game means something to you. Chad Moon, March 20, 2019 at 12:38 p.m. He also had that bad tackle that should have been a penalty just after the own goal. He, along with most of the players that day, should never put on the national team jersey again. Jay Ramirez, March 20, 2019 at 1:04 p.m.
Could not agree more. Most of the players, not all, are a bunch of primadonnas that don't care enough. I liked Alexi Lalas description, "tatooed millionaires". I think the fitting punishment for these players is that they get to keep that game as their last time in a US jersey. beautiful game, March 20, 2019 at 6:21 p.m.
NT coach wants to spend precious time on players that have not consistently contributed. He's more loyal to them than to the NT plan of fielding the best players available, not matter what size, speed, or past medals. I'm totally disappointed. Jay Ramirez, March 20, 2019 at 9:30 p.m.
We will know more when we see who actually plays. It could be that Gonzalez is there just to prove that other players are better. I hope that is the case, i don’t want to see Gonzalez play in a game that he doesn’t deserve to play in.